UTOPIA was initially an ensemble, formed by TODD RUNDGREN as a counter-point to his solo work. Various musicians came and went, but the main stays of the band were ROGER POWELL (keyboards), KASIM SULTON (bass), and JOHN "willie" WILCOX (drums), and of course TODD himself handling the guitar work, all four members supplied both lead and harmony vocals. Their first album "Todd Rundgren's Utopia" consisted of only four tracks! This was at the height of prog/fusion, and so the quality of musicianship was undeniably high. Between this and "Ra", the line-up was amended, until the four members noted were "the band". Further albums were forthcoming, with a more democratic look to the songwriting credits, but it was always Todd's band. Lead guitar, and most of the lead vocals, plus the major chunk of songwriting were his, this was not to the detriment of the other members, but the boss was always pre-eminent. For your further listening pleasure, find the following albums. "Another Live", "Oops! Wrong Planet", "Adventures In Utopia", "Deface The Music", and "Swing To The Right". You may find the last couple too "poppy", but you have to realise that Todd Rundgren has always been, and still is, one of the best writers of the infamous "three minute ditty". However, if your taste is for ten-thirty minute, multi-part epics, you won't find many better than on the first two quoted albums. Take half an hour out of your day, and listen to "The Ikon", the track which takes up the entire second side on the vinyl version of "Todd Rundgren's Utopia", I guarantee you will come away impressed. 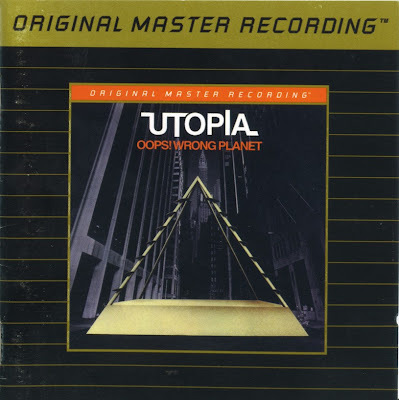 hi can you please re -up this Utopia release ?